If you have been looking for an entry level 9/11 film to gently draw friends and relatives into the harsh light of that day or push wavering official story adherents over the edge, this clear, compelling and beautifully crafted documentary is just what you’ve been waiting for. As the first movie to tell the story of the 9/11 Commission- spawning “Jersey Girls” and their feelings of betrayal in its wake, it is an intensely human tale; but it also crisply exposes so much government deception and media complicity along the way that the effect is politically explosive as well. Told largely in the words of key 9/11 family members and 9/11 Timeline creator Paul Thompson, the news byte-backed narrative carefully exposes the pattern of official deceit from Ground Zero to Afghanistan. In sum, “9/11: Press for Truth” is an immensely important new 9/11 film for Middle America that should be sent to every church, school, library and political representative. Please do everything you can to draw attention, crowds and media coverage to its September premiers and early showings so it has a shot at the national distribution it so richly deserves. 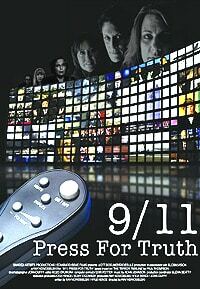 – Emotionally moving, fact-driven documentary promises 9/11 truth a whole new demographic appeal. Paul Thompson mentions ‘PRESS FOR TRUTH’ on air. press, the filmmakers, and a few special TBA celebrity guests.